Eye Candy - Spokane Hardware Supply, Inc. There are some products we carry that I go "Hmmph, not my personal style but man that's a beautiful piece of hardware." Yes, I really do say that, often actually. My personal style leans toward modern, clean lines, no fuss and typically silver tones. I thought I would share some items that make me want a space designed just so I could use them. 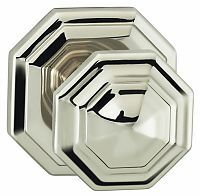 This door knob by Omnia...gorgeous. Just looking at it, you can tell is good quality. 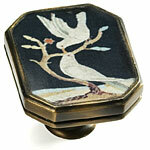 How about this cabinet knob by Schaub & Company. It's part of their Symphony Designs series. Hand painted hardware, so cool! It's literally a miniature piece of original artwork for your furniture. Orange, really? I know, orange is one of my least favorite colors but on the right piece this could be really neat. I love how Emtek uses a traditional design and put a modern spin on it with the orange color. 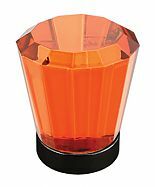 They also have these and a turquoise(ish), black, and smoke. It's hard to choose just one from the collection. I realize quite a few of these are cabinet hardware but they're just so easy on the eyes. This next one is one of my all time favorites. It's simple but has just the right amount of detail. Could be modern, could be traditional, even a little industrial. Amerock hit the mark with the entire collection. Lastly, I cannot rave enough about the quality of these cabinet hinges by Deltana. 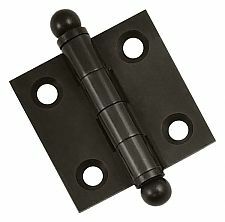 I know eye candy is a stretch because come on, it's a photo of a hinge. Seriously though, these hinges are by far the nicest cabinet hinges I've ever seen. I keep one at my desk just to flip back and fourth sometimes, the action is so smooth. Yeah, sometimes we're a bit nuts over hardware here. If you're application arises to use a full inset hinge, I would recommend this brand first every time.